New World Library, 9781608680771, 122pp. There is a hidden meaning, a hidden beauty, in life's most ordinary moments. It is the beauty of the human heart revealed, where what we have in common is greater than what keeps us apart. If we can learn to see the beauty in these moments, whether they are in the light or in the shadow, we become witnesses to the spiritual, testimonies to the sacred. We become true artists of the ordinary, and our life becomes a masterpiece, painted in the colors of the heart. A chance encounter with a boy on a bicycle, a young girl's graduation from eighth grade -- these and other small moments are the subjects of this beautifully written collection. 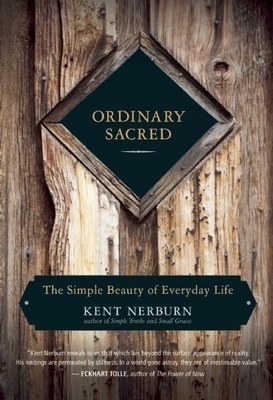 Kent Nerburn uncovers the wonder hidden just beneath the surface of everyday life, offering poignant glimpses into the grace of ordinary days. Whether he's describing a kite's dance on the winds above the high New Mexico desert, a funeral on an isolated Indian reservation, or a dinnertime conversation with family and friends, Kent Nerburn is among a handful of writers capable of moving so gently over such deep waters. Ordinary Sacred reveals the hidden beauty waiting to be discovered in each and every life. Kent Nerburn holds a PhD in religion and art and is the author of many books, including Letters to My Son, Simple Truths, Small Graces, The Wisdom of the Native Americans, The Wolf at Twilight, and Neither Wolf nor Dog, winner of the Minnesota Book Award. He lives in northern Minnesota.